Morpeth, the League Champions, ended their campaign with an exceptionally hard fought victory against third place Morley, who may well feel disappointed at having lost a game they probably deserved to win. It’s strange when you look back to the first match of the season when Morpeth travelled to play the same Yorkshire rivals, it resulted in another Morpeth victory and again the Northumberland side were second best for long periods of that contest. This was a free flowing game in front of a large crowd. Morley took the initiative early on, dominating possession, with the home side struggling to cope with the absence of Ben Sandall both in the tight and in loose play. It was against the run of play when Morpeth took the lead when an excellent Jardine run and neatly timed inside pass, saw full back Telford, again with the ability to both time the run and also take the right line, race over near the posts for Hornby to convert for 7-0 after 13 minutes. 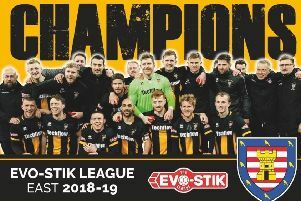 Morpeth, the League Champions, ended their campaign with an exceptionally hard fought victory against third place Morley, who may well feel disappointed at having lost a game they probably deserved to win. It was against the run of play when Morpeth took the lead when an excellent Jardine run and neatly timed inside pass, saw full back Telford, again with the ability to both time the run and also take the right line, race over near the posts for Hornby to convert for 7-0 after 13 minutes. Morley continued to cause the home side problems and drew level with a converted try of their own on 25 minutes at 7-7. The first half continued to entertain with two further Hornby penalties, between an unconverted Morley try,13-12 in Morpeth’s favour at half-time. The second half started brightly for Morley, backs and forwards combining for a try wide out. Another penalty increased their lead to 13-20 on 50 minutes. Things were looking gloomy for the home side until right wing Jonny Ward turned the match around with three cracking tries in the space of 25 minutes. On 52 minutes, his quick witted opportunism saw him crash over from a tap penalty for Hornby to convert bringing the scores level at 20-20. This was short lived when Morley scored a somewhat fortuitous try when a rebounded grubbed kick fell favourably in their direction. The follow up and touch down was followed with an excellent conversion for 20-27. This was before Ward lit up Mitford Road with two top scores, the second being an outstanding individual effort. Firstly he appeared just inside the left wing after backs and forwards had combined on 65 minutes to touch down for an unconverted score for 25-27. Then on 78 minutes, as the home side stepped up the pressure, the ball was sent wide without penetration until it arrived with Ward, who stepped and swerved at pace to score a try few others could. Man of the match - despite skipper Carl Hill’s attempt at bribery by kindly donating his cigars, ( please note future bribery attempts will always be well received), it has to be Jonny Ward.